Read other customers views on this product. Keep you Fuji Instax camera alive with replacement film. This twin pack (20 shots in total) continues to allow you to produce great results within seconds. 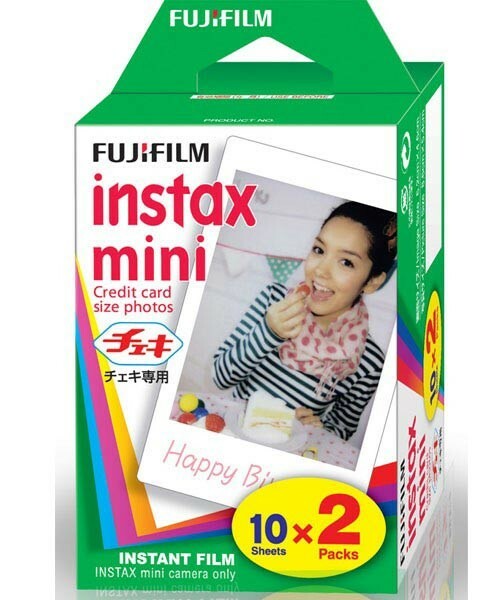 This is a twin pack (20 shots) of Instax Mini Picture Format Instant Film from Fuji. This is an incredibly sharp, credit card-sized, daylight-balanced ISO 800 film made for use in Instax Mini Series Cameras. Recognized for its excellent color reproduction, the film has a glossy finish and is an excellent choice for general use, portraiture or even with electronic flash. It's also a fun film to use - easy to load, shoot and best of all - no wasted time at the lab wondering how your images came out. Due to its "mini" size, it is easier to carry, file and store when compared to larger, more traditional film formats. Even in low light scenarios, due to its high-speed rating, Instax Mini Film will produce amazingly sharp images. Another user benefit is that it has been improved to lessen the developing time before you see your print - a real benefit when you're photographing young children who are notorious for wanting everything "yesterday". Instax Mini Film has also been enhanced to maintain its stability over the years making it a good choice for archival storage. Those pictures you shot when your kid was 4 - or during that trip to Disneyland will still be around long after he's out of high school. Fuji has also extended the working temperature range of this film to include 40 - 104°F so you need not worry about using it year round. Spring is here and it's time for a Spring Clean! Have you got working, but unused cameras and lenses lying around? Part-exchange them against any new camera or lens over £250 and we'll give you £50 on top of whatever they're worth. Head over to our Part-Ex page and fill out a form so we can give you a quote or head into your local store with your equipment and let our experts take a look.